Close to four years after the surrender of Nazi Germany in World War II, the three Western Occupational Allied Powers of Germany, realizing they weren’t going to get cooperation on the recreation of a German State from the Soviet Union, created the Federal Republic of Germany out of their occupational zones, except for West Berlin and the French Saarland Protectorate, on May 23, 1949, with the ratification of Basic Law, the new nation’s constitution.. 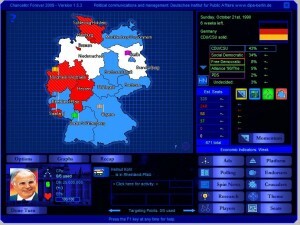 Elections for the Bundestag, or Federal Parliament, are now being held. Konrad Adenauer’s new CDU and it’s allied CSU, Free Democrats, and German Party intend to form a centre-right coalition against Kurt Schumacher’s Social Democrats. And the Centre Party stands in between. But with Communists, Neo-Nazis, and Bavarian Separatists nipping at all three sides’ heels, who will come out ahead? After the historic 2008 election, which ended 25 years of Conservative Party governance, Alexandria elected a centre-left government headed by the PDP-LDP led by First Consul Jean Carmichael. This upheaval resuletd in the collapse of existing parties and the creation of new ones. And despite a successful governing term, First Consul Carmichael faced growing political opposition. 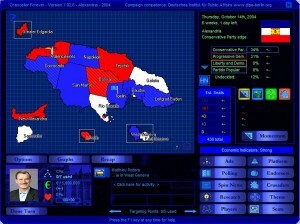 With 4 new parties contesting the 2012 election, the polls have tightened in time for the regularly-scheduled election. Who will lead Alexandria for the next four years? The incumbent Alexandria Conservative Party has ruled the mighty Empire of the Alexandrians for the past 25 years- but with their disastrous handling of Micro-World War III and Sennar coupled with a severe economic crisis and an embarassing spy scandal at the start of the year, their days may be finished. Are winds of change blowing in the cool sea breeze, signalling a PDP-AAP landslide? 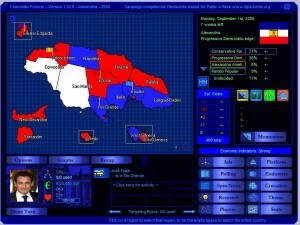 The Empire of Alexandria, a sizeable island nation within the Caribbean, is holding its Parliamentary election in 2004. It is a diverse island with Spanish, French, Indigenous, and German heritage. The incumbent Alexandria Conservative Party faces a close re-election campaign as the Empire faces critical foreign policy issues, a rebellion in an overseas territory, and rising social problems. 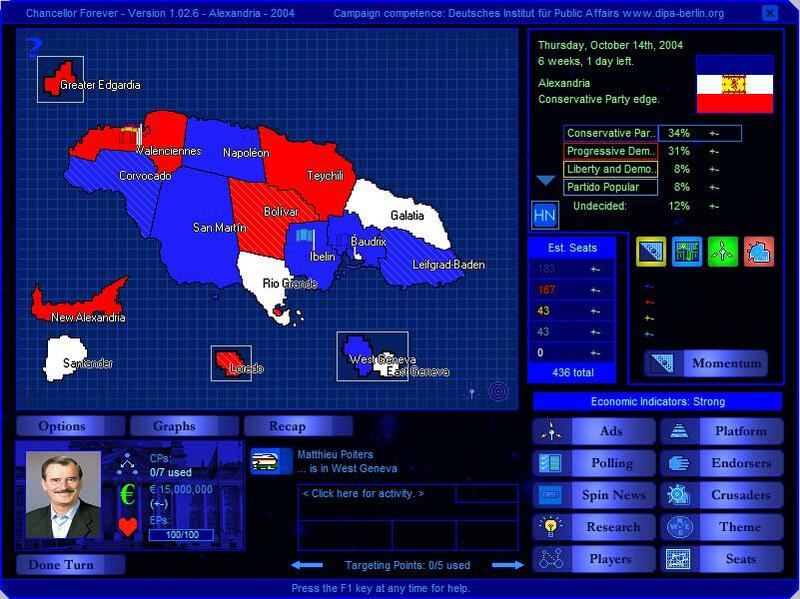 However, with a strong economy and coalition partner- will the ACP weather the storm, or will the Empire elect its first centre-left government in 20 years? – Also check out the site that is the inspiration for this scenario. 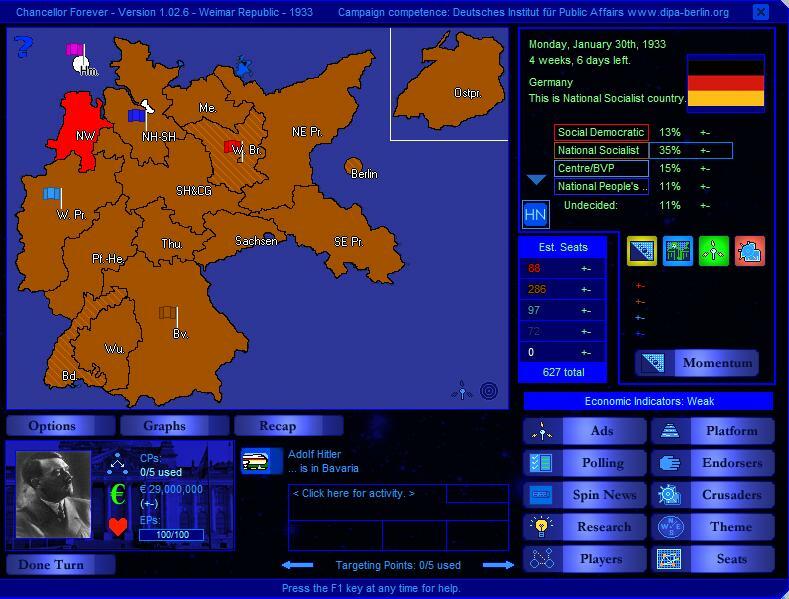 The Weimar Republic’s troubles continue as recently appointed Chancellor Adolf Hitler has dissolved the Reichstag to call for new elections, in the hopes that the Nazis and their nationalist allies can win a large enough majority to build a more authoritarian state. But the Nazis’ popularity may be waning, and meanwhile the opposition is divided between the hard-line Communist Party, the comparatively “soft” left-wing Social Democratic Party, and the Catholic voting bloc of the Centre Party and Bavarian People’s Party. With Nazi- and Communist-instigated street violence raging and the economy in dire straits, no one knows quite what to expect — but supporters of the Weimar Republic fear that a Nazi victory could be democracy’s death knell. Will this election be the end of democracy in Germany, and the first stop on the road to World War II? To many Stormark reminds them of a glorious Viking past. Situated among the rocky yet fertile coasts and fjords of the Atlantic, this former Scandanavian colony is holding parliamentary elections in the fall of 2008. Who will win control of government and decide the future of the Viking empire? 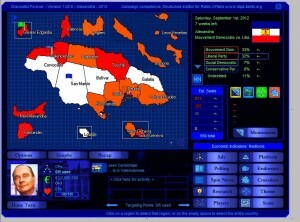 This scenario has been updated with new regionalism, issues, and other dynamics. 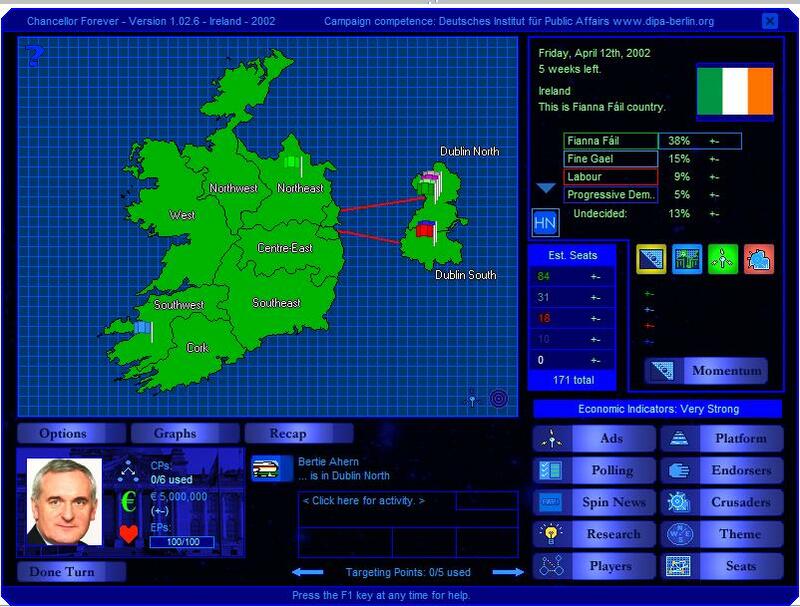 – Also check out the site that is the inspiration for this scenario. The 2007 Irish General Election has occurred as scheduled, with the race becoming a contest between the Fianna Fail-Progressive Democrats government and a broad-based “Alliance for Change” of Fine Gael and the Labour Party. However, the rising Green Party may upset the political status quo. Can Fianna Fail secure a 3rd successive government on the back of a strong economy? Taoiseach Bertie Ahern’s FF-PD coalition has overseen five years of strong growth and occasional controversy. They now face the most divided opposition since the 1940s. Will Fine Gael and Labour regain support, or will the smaller parties have the best of it? And can Ahern win the greatest prize in Irish politics – a majority government?